and it is ready to be devoured by turkey goers everywhere! No offense to pumpkin pie and all the other delicious Thanksgiving desserts of course! You might have noticed by now that we are pretty serious about our chocolate around here. 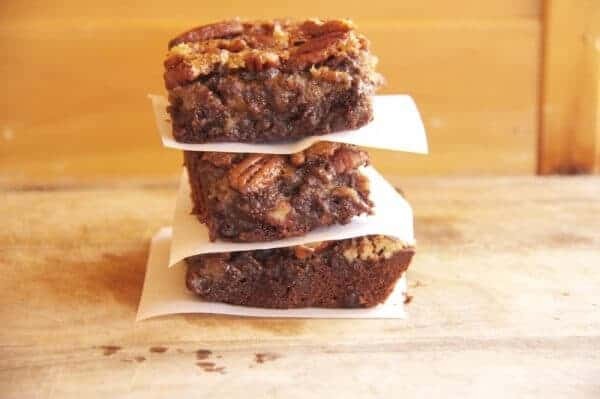 So the thought of combining pecan pie with brownies is just genius! This is one of the best baked goods that has come out of my kitchen. Seriously. Like no joke possibly the best this I have ever made! The brownies themselves are out of this world amazing. Gooey, moist and so chocolatey. The batter alone is scary delicious! I think we could have just devoured the brownie batter and called it a day. But I was on a mission. I put a stop to the multiple fingers inching their way into my mixing bowl (and when I say multiple I mean like 6 different hands, the batter was popular) and carried on towards the finished product. As for the topping. 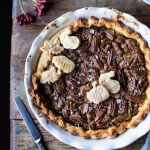 I mean could there be a better combination than pecans, bourbon, and chocolate? The answer? No. Well at least not around here. Even the unbaked filling is soo good! Treat yourself to a spoonful of the stuff. You have to, like you really have to. The holidays are fast approaching and these are perfect for both Thanksgiving and Christmas. Festive and delicious! If you want to get some major brownie points wrap these up as a gift or bring them to Thanksgiving dinner. Trust me people will be begging you for the recipe. Pre-heat oven to 350. Grease a 9x13 pyrex pan. Beat eggs with a mixer. Add sugar and vanilla, beat well. Add flour and salt. Stir in chocolate chips. 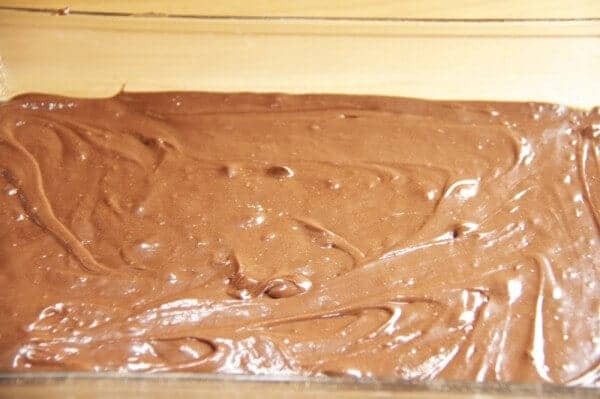 Spread evenly in pan, it will make a thin layer. 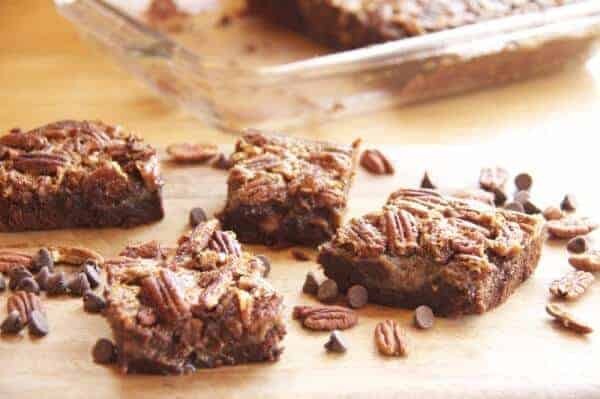 Well the brownies bake make the pecan topping. Using an electric mixer, cream karo syrup and sugar until smooth. Add in eggs and vanilla and beat until combined, then add butter and whiskey. Once mixture is thoroughly combined, fold in chopped pecans and chocolate chips, then pour over brownies. 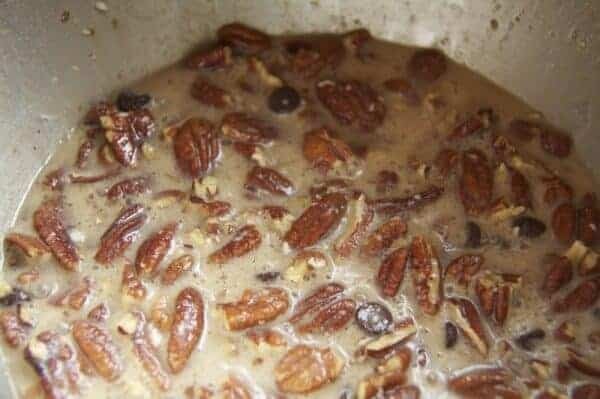 Bake for 30-35 minutes, or until pecan filling is set. A little jiggle is ok.
Let cool completely before cutting*. Top with whipped cream if desired. *Please do not cut them well warm! If you need to cut right away stick them in fridge to set for a few minutes. Whatever you do just make these and make a lot. Now. They will be gone before you can scream GRINCH! 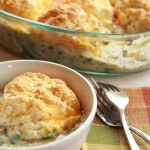 Sorry, this looks great, but the recipe doesn’t say how much flour to use. You are right I am so sorry! I updated the recipe, but you need 3/4 a cup all purpose flour. Thanks for bring that to my attention. Let me know if you like them! Never heard of Karo syrup in South Africa, what is it? Karo syrup is basically just corn syrup. It is used in a lo of baking. You could also use brown rice syrup. 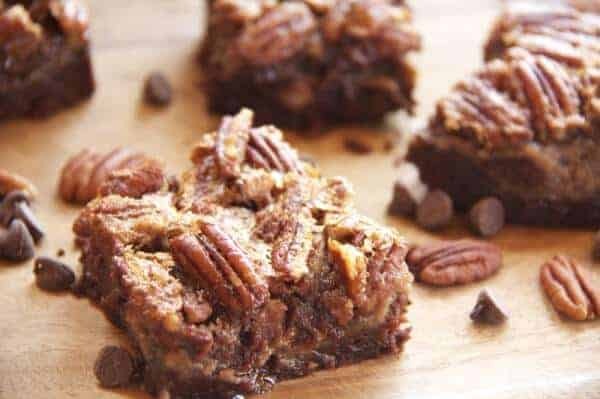 Ooh, I am such a pecan lover – I will try these for sure! I also pinned this – fabulous! Thanks for pinning! 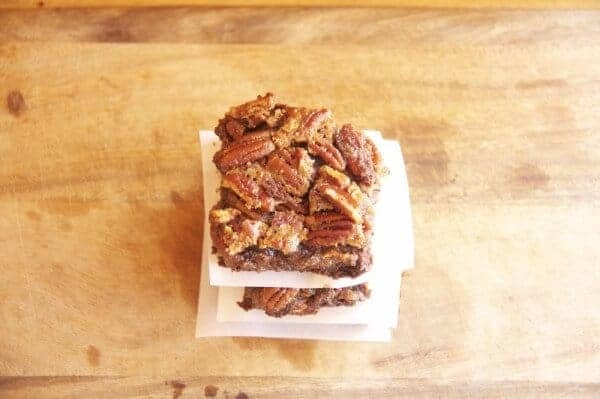 I love pecans to, especially around this time of year! Let me know how they turn out! Oh my heck! I’m so making these! They look AMAZING!!!! This does sound out of this world amazing! Pinned! Thanks so much for sharing on Busy Monday! Brownies filled with pecan pie? Oh my word…I am in heaven! Those sound so stinking amazing!!! You just combined two of my all-time favorites! Love it! I would take these over pumpkin pie any day! Holy Yum! I am featuring these at tomorrow’s Back For Seconds Social. Congrats and thanks for linking up!! 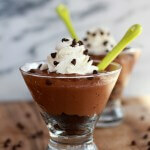 I’ve already printed, pinned and bought the ingredients to make these! That’s how much I love them! They look divine and I can’t wait to sink my teeth into one. Mmmm. Thanks so much for linking up to Creative Thursday. Can’t wait to see what you share this week! Have a wonderful week. OMG! You just combined two of my all time favorites! I will have the try out this recipe for sure. Thank you for sharing on Foodie Friends Friday Linky Party. Please remember to link your recipe back to http://www.foodiefriendsfriday.com. Wow! These look beautiful! 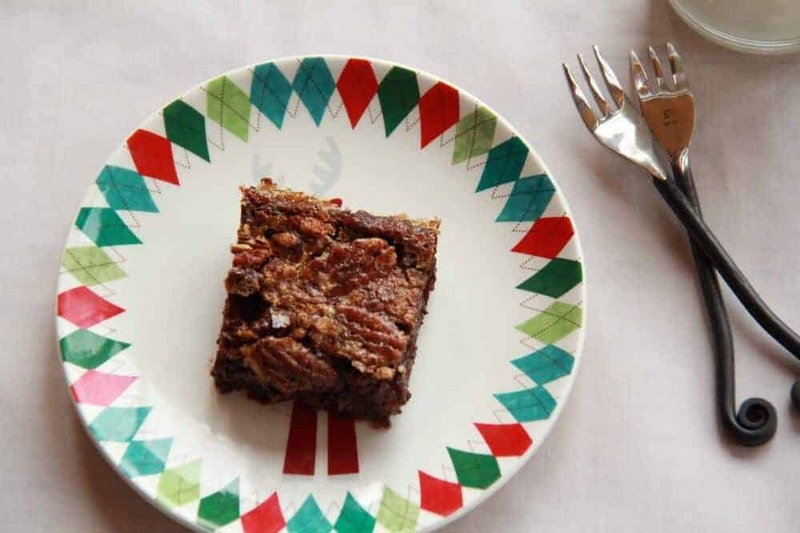 I’m a pecan pie lover and the idea of pecan pie and brownies never crossed my mind, but it’s brilliant! 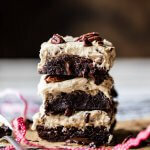 Those brownies look so gooey (which is possibly one of my favorite ways to have brownies). I’d love to give these a try soon! If you want an even gooey brownine add a half cup more of the chocolate chips! They are so gooey you need a fork to eat them! Enjoy! I think my family would go nuts over these. Any ideas of what to substitute the whisky with? Or could I just leave it out entirely? You could just leave it out or add more vanilla extract. I love vanilla! Pecan Pie and Brownies!!!???!! SO good! What a creative recipe. Thanks for sharing! These look wonderful! Thanks so much for sharing on Busy Monday! Stop being so damn talented… no wait don’t I want your food! LOL, I am completely and utterly obsessed with your twists on classics! Can you half this recipe to fit an 8×8 pyrex? Yes! That works great! Have a great Thanksgiving!! These were delicious! They came out wonderfully…everyone loved them. They were the perfect Thanksgiving dessert! So happy you enjoyed them!! Thank you!